We offer more than 1800 maps. See each spectrum holder’s depth by spectrum type mapped on a county level for all 50 states and Puerto Rico. In addition, each spectrum type is grouped into a category (Sub-GHz, Mid-Band and MM Wave, Grand Total) which is then charted by carrier. Each map comes in two formats: an 8.5 x 11 inch high-resolution PNG file that is presentation ready and larger-scale vector version in EPS format so you can customize, crop or print to any size without losing resolution. 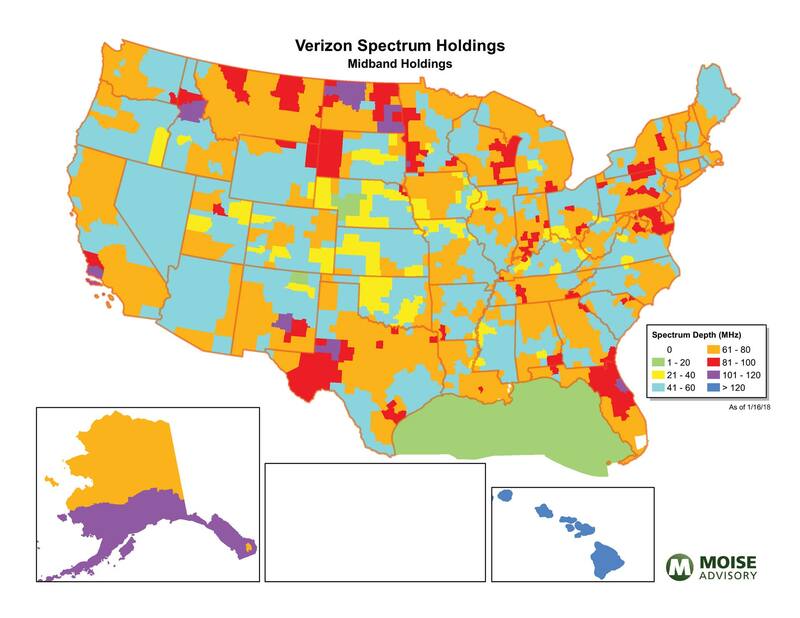 Our spreadsheets provide spectrum depth and MHz-POP positions of each owner by county for each spectrum type (Cellular, SMR, 600 MHz, 700 MHz, PCS, AWS, AWS-3, EBS, BRS, WCS, AWS-4, AWS H-Block, and UMFUS). These spectrum types are also summarized into four categories—Sub-GHz, Mid-Band and MM Wave, Grand Total. AT&T, DISH, Sprint, T-Mobile, Sprint/T-Mobile combined, US Cellular, and Verizon are presented first followed by a total of all other holders, which are then listed separately. Geographic summaries (CMA, PEA, BEA, BTA, State, Nationwide) follow below the county data. Since the spreadsheets contain so much information, each row and column is tagged with plain-English monikers for easy search so you can get to the right information quickly. In addition, each spreadsheet is presented in pairs—one grouped by spectrum type then company and a second grouped by company then spectrum type so you can make the right comparisons quickly and easily. Those using GIS programs for RF design and marketing analysis will have access to all county-based information as shapefiles. For ease of use, the spectrum depth ownership data has been organized into six sets of shapefiles—EBS/BRS, Cellular/SMR, Sub-GHz, Mid-Band, Millimeter Wave, and Other. For more extensive analysis, we include demographics for each geographic area (County, CMA, PEA, BEA, BTA, State, Nationwide). The spreadsheet contains 2016 population estimates, 2010 and 2000 census population counts, households, mean household income, average age, population density, land square miles, and water square miles. GIS users have access to those boundaries as shapefiles. We also provide information on blocks and frequencies of each spectrum type as well as a table that associates the FCC’s licensee’s name with the carrier’s street name (i.e. Tide Mobility, LLC is AT&T). Summary Intel. 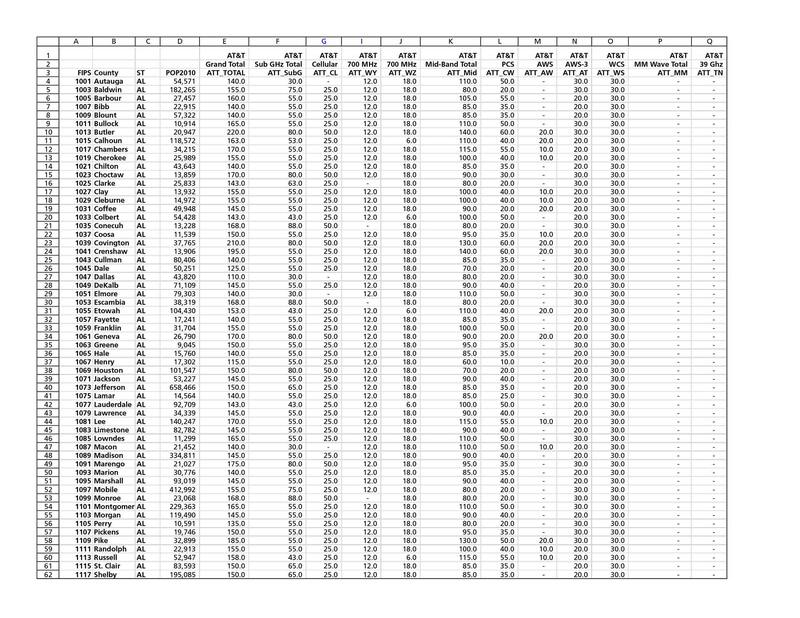 Spreadsheets and maps that detail spectrum depth for AT&T, DISH, Sprint, T-Mobile, Sprint/T-Mobile combined, US Cellular, Verizon and Others’ aggregated into Sub-GHz, Mid-Band and MM Wave, Grand Total categories and geographically presented in County, CMA, PEA, BEA, BTA, State, and Nationwide groupings. 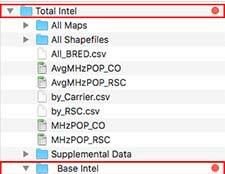 Additional spreadsheets detail MHz-pop for the above listed group in the same seven geographic formats. Base Intel. All the information in Summary Intel, plus the components that constitute the spectrum depth summaries. Get specific spectrum depth in the following bands: Cellular, SMR, 600 MHz, 700 MHz, PCS, AWS, AWS-3, EBS, BRS, WCS, AWS-4, AWS H-Block, and UMFUS. For each of these seven spectrum holders, each category is charted with maps. 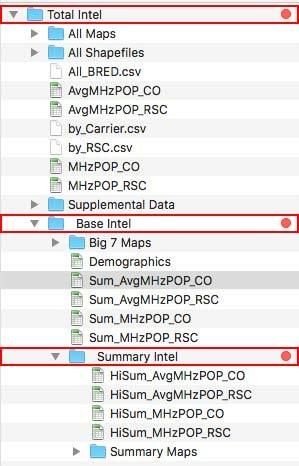 MHz-POP positions are provided in spreadsheet format and demographic data is included. Total Intel. All Base and Summary Intel information plus the spectrum depth charts and maps are expanded to detail every holder. Spreadsheet data includes block-by-block analysis to provide you with the most granular level of detail. All GIS shapefiles are included as well.